Rooks At Dusk: On the Other Side of Despair, What is Left to Believe In? Ray Young, an experienced Christian leader, has been married for almost thirty years. But his once-vibrant faith, like his marriage, is steadily fading, and relations with his only son Ollie, a struggling stand-up comedian, are increasingly strained. Facing a looming crisis of faith, Ray begins an anguished, escapist affair, only for Ollie to discover his father's infidelity. Confronted by his actions, Ray has one chance to rescue the life that is crumbling around him. 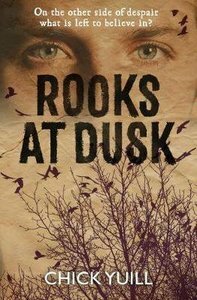 But when tragedy strikes, it seems all hope of redemption is gone ... Rooks at Dusk delicately explores questions of grace and forgiveness in a world where not everything can be mended, but where there is still reason for hope. About "Rooks At Dusk: On the Other Side of Despair, What is Left to Believe In?" Chick Yuill is a speaker and writer with a growing passion to bring matters of faith out of the narrow confines of a religious ghetto into the wider arena of public life and discourse. He has been married to Margaret for 48 years and they have two adult daughters. His previous novel Rooks at Dusk was published in 2017.